Ask fellow campers about "La Salle Lake State Recreation Area" and nearby attractions. 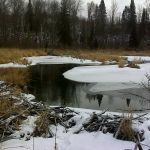 We wanted to visit Lake Itasca and see the headwaters of the Mississippi. 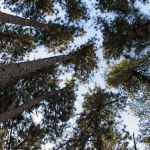 I had been looking for a site within the Lake Itasca State Park for two nights, and could not find any single site available for the two nights that we wanted. The campgrounds require online booking, and there is a booking fee for each reservation unless you make the booking on the day that you are checking in. I had decided that I would book the first night on the morning we were to check in and the second night on the next morning, when I was looking on AllStays and noticed that there was another state campground, La Salle Lake State Recreation Area, just 10 miles away - and it had plenty of availability and full hookups - for just a few dollars more a night ($37/night + $7/day vehicle pass). We did the online booking on the day we were going to check in so saved the $8.50 booking fee. The La Salle Lake campground was very nice - long sites with decent separation from neighbors (and since it was sparsely occupied, we didn't have anyone in the sites on either side of us). The camp host came to greet us and was very neighborly in being willing to answer questions or provide help if needed. When we first parked in our site, we were a bit unlevel side-to-side but then realized that there was a crown to the site and if we straddled it we would be in better shape. We camped at La Salle Lake State Recreation Area in a Motorhome. Visit Lake Itasca State Park and the Mississippi headwaters and visitors center. Get groceries before you come (there is a Walmart in Park Rapids where we boondocked the night before checking in so we had less than an hour's drive to get to the campground - but that would have been a long drive if we'd needed to go back for groceries). Walk down to La Salle Lake and enjoy the quiet. This was previously a private, mostly seasonal, park before the state bought it. Single lane road in and out with turn-around at end, would be impossible for two campers to pass each other on most of the road. A few sites are reasonably level but most are difficult. Trees and site# signposts make entry and exit challenging. We could exit our site only by driving across the next site's grass. Other than these issues, it's a great campground....peaceful and quiet, convenient to Itasca State Park, 30 minutes from Bemidji (groceries, laundry and fuel). Wifi is excellent (and free). Entry to LaSalle Lake is about half a mile west off the main road. 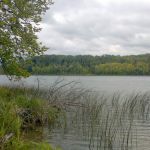 The lake is suitable for kayaking, canoeing and small fishing boats (10 mph speed limit) but has challenging boat entry. Trail from campground to lake is .3 mile long and quite a hill. Cannot see lake from campground. Campground employee said the state plans to expand and improve the place but no date on when that would happen. He also said the campground usually has vacancies during the week but weekends are always full so reservations are important. We camped at La Salle Lake State Recreation Area in a Fifth Wheel. When Minnesota increased their state park fees on 7/1/2017 they made annual passes free for disabled veterans, even non-residents. If you fall into this category, get an annual pass sticker at the Itasca State Park visitor center. The history museum and Lyle's Logging Camp exhibit in Cass Lake are well worth a visit. Very nice FHU back in sites with fire pit and picnic table. 5 miles from Itasca State Park..same entry pass gets you into both parks. Itasca Park Campgrounds were full midweek, La Salle had over 30 sites open. Restrooms with private showers and laundry available on site. We camped at La Salle Lake State Recreation Area in a Motorhome. All the features of Itasca State Park are 5 miles away. Headwaters of the Mississippi River and Douglas Lodge for meals. Nice park with widely spaced sites. Many sites are not level enough for our auto level to work. We moved three times to find a site where we could level the rig. Once leveled and hooked up, very nice. It was a good thing the park was mostly empty; would have been a disaster if it were full. The state park reservation system leaves a lot to be desired. You can reserve a site online but someone can drive in and fill out a reservation card and park in that spot and you have no recourse. No lights at night; very dark with clouds or no moon. All sites are back-in. Can be a challenge given all the trees and signposts. The state requires a $5.00 per day sticker on all vehicles entering the park so that should be added to the price. We camped at La Salle Lake State Recreation Area in a Fifth Wheel. Very nice setting near Itaska Sate Park. Sites well spaced and long back-ins. Good road within park. Quiet. Well maintained. All sites are full hookup. Good shade but many spots (1 thru 8) will allow satellite reception. Most sites slightly un-level gravel. About 30 minutes to Bemidji and 10 minutes to Itasca state park. We will be back. We camped at La Salle Lake State Recreation Area in a Motorhome. Excellent biking paths and other activities at Itasca State park. 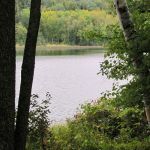 Are you affiliated with La Salle Lake State Recreation Area ?